We have lived here for the last 10 years and love to meet new people every year. We have lots of animals and beautiful gardens for everyone to enjoy. A perfect fit for our family of 5 - we all spent time reading, playing games, and touring the country side. The community meals offered by the hosts were perfect to meet the neighbors and the bread fairy each morning is an excellent start to the day. The location was extremely convenient to Utah and Omaha beaches for our WWII themed touring. And the McKinleys are wonderful hosts - always with a cheerful greeting and great tips for the area. What an incredible experience we had. We were welcomed by Zoe, Paul and Hector. Everything about the cottage was quaint. I wish we could have spent more time just relaxing and enjoying the magnificent grounds. We hope to be to come back again and just relax. Thank you for being so hospitable. We have visited Chateau de Monfreville every year for the past 9 years. Words cannot express the beauty, the hospitality, and the comforts of rose and pond cottage. Both cottages are tastefully decorated, extremely comfortable for groups, and children, and come stocked with all the essentials. The location is superb, clean and easy to access all the tourist sites. The McKinley family are gracious hosts,problem solvers, and warm hosts. You will not be disappointed. We look forward to our annual visit, and find it difficult to leave this magical place. wow is all I can say. We had a fantastic week stay at Rose cottage,all the comforts of home,up most hospitality and beautiful grounds. The history in the area is incredible and this is a perfect spot to be home port. We were planning our next time on the plane ride home.. Thank you Gary for your very kind comments and we very much hope to see you again. Our second visit to Chateau Monfreville...we love it! 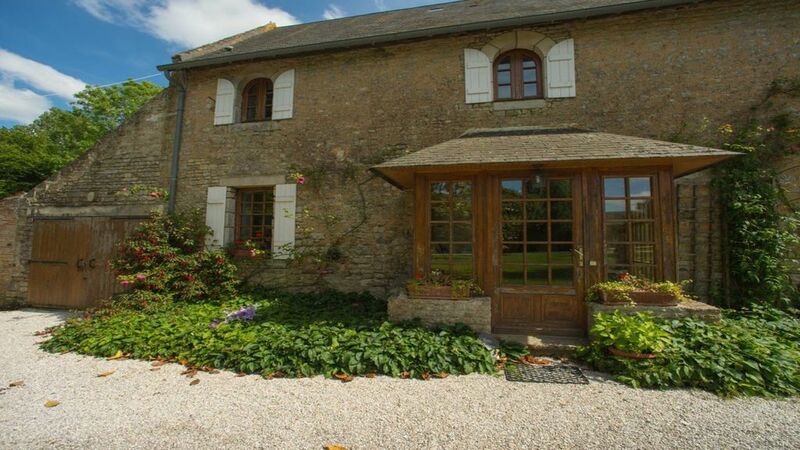 Rose Cottage is a perfect little hideaway, situated in the grounds of the Chateau. Everything you need for a totally relaxing holiday is right here. The cottage is fully equipped with everything you need...including a woodburner in the sitting room. Beautiful private little south facing garden with outside eating and barbq, bikes ...if you feel energetic, hot tub - great after a day exploring the Normandy beaches,, a little honesty shop, ping pong table, chickens and happy pigs who will sit on command....for food :-) and of course, Hector...the happiest dog in the world. Zoe and Paul...the most charming hosts , who make you feel like long friends...always happy to share wine and a laugh. Thank you Jim & Sonia. We love having you to stay - we hope to see you again some time soon. There is so much to do in Normandy. Famous for its amazing food such as cider, cheese and butter. Beautiful towns such as Bayeux to visit and beaches that are steeped in history. We are near to Omaha and Utah beaches where World War 2 and the landing beaches are visited by millions of people every year.